There were 4 long leading indicators that were on the cusp of changing. To see what happened, please put a penny or two in my pocket by heading on over and reading! Why don't I see any more Doomish commentary on how commercial and industrial loans are turning negative and ensuring a recession? "in the last three quarters, the Senior Loan Officers have reported a slight loosening of standards, which suggests that commercial and industrial loans will continue to flatline through about the end of the year, and improve in 2018." Which is, of course, exactly what they did. My long-form take on housing sales, updated with yesterday morning's housing permits and starts report, is up at Seeking Alpha. 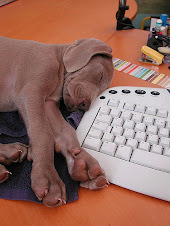 Like my Weekly Indicators posts, I make a penny or two when you decide to read. So decide to read! Also worth mentioning: my overall view of housing differs somewhat from that of Bill McBride a/k/a Calculated Risk. 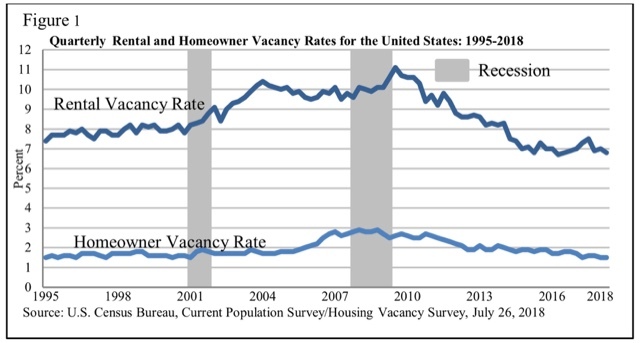 Like Bill, I don't think housing has already peaked. But unlike Bill, I see inventory as the tail, rather than the (a?) head. "Months' inventory" typically turns up precisely because sales turn down, so doesn't give me any new information. Also, Bill is really focused on the demographic tailwind, and on "pent-up demand." I'm not sure about the latter, since the bubble years where 2+ million units were added a year, coincided with the demographic *nadir,* i.e., there was a lot of excess housing to be absorbed. 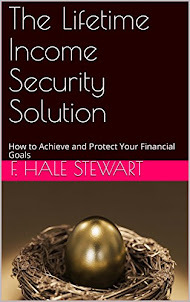 As to the former, high enough interest rates and prices will be enough to overcome it. I don't think we're quite there - yet. This morning's report on housing permits and starts was a mixed bag. Permits, while below their single family peak in February and their overall peak in March, were higher than last month. Their shorter term trend is neutral while the 12 month trend remains positive. Starts, on the other hand, were lower YoY for the second month in a row. Single family starts had their lowest month since last December. Because of their volatility, the best way to view starts is as a 3 month average. But even so viewing, starts made a 7 month low. The last two months are equivalent to the low readings of last summer, and no better than average compared with 2016. 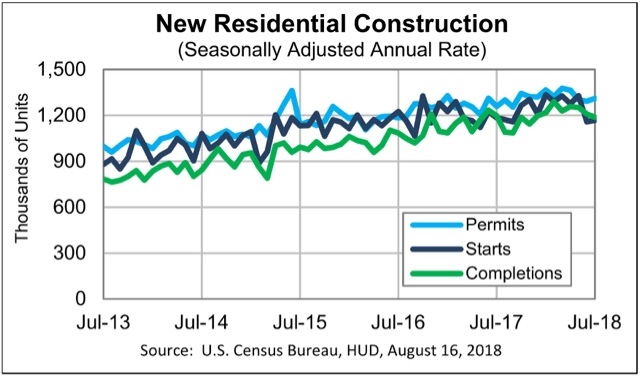 Still, because permits tend to slightly lead starts, and single family permits are the least volatile measure of all, the trend in housing must continue to be counted as a weak positive. This, by the way, contrasts with the weekly data on purchase mortgage applications, which is now down YoY even as measured over a 4 week average; and is among the lowest readings of the last 18 months. Both industrial production and retail sales for July were reported this morning. Let's take a look at both. 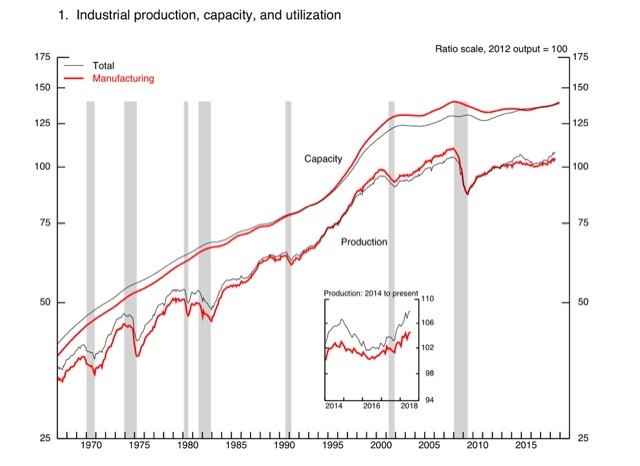 At the same time, if you zoom in on the inset, you can see that manufacturing growth has slowed down somewhat this year. It is only up +0.8% in the last 5 months, after having risen 2% in the 6 previous months. There has been some evidence in both the regional Fed reports and the ISM manufacturing index of a little cooling -- from white hot to red hot -- in manufacturing activity in the past few months. This report is of a piece with that cooling. Tomorrow both the Empire State and Philadelphia Fed regional manufacturing reports will be released, and may (or may not!) give evidence of further cooling this month. I expect per capita real retail sales to turn about a year before any downturn in the economy as a whole. This suggests continued strong employment growth in the next few months. One thing to watch for is what happens when last September's outsized +1.3% monthly increase drops out of the YoY calculations two months from now. But the nowcast as indicated by the two reports is continued good growth in both production and consumption. Note that the two lines intersect (meaning the spread between them is 0.30% three times in the past 45 days: first when the 10 year bond was yielding about 2.83%, then when it was yielding 2.87%, and last week when it was yielding 2.98%. In other words, the dynamic is that the yield on the 10 year bond has to be at higher and higher levels in order not to be too tight. And the higher those 10 year bond yields, the higher mortgage rates go as well, gradually strangling the housing market. Can the Fed successfully steer between the Scylla of an inverted yield curve and the charybdis of a housing market downturn? 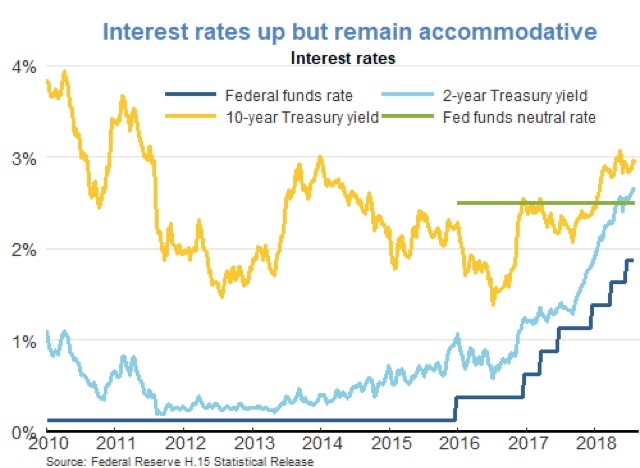 If the Fed stops after two more hikes, it's at least possible that there could be a tight but not inverted yield curve with 10 year bonds yielding roughly 3%. But the Fed's own "dot plot" from their meetings suggest that they intend to hike the Fed funds rate to at least 3%. If that happens, I see no way the economy doesn't wind up on the rocks. 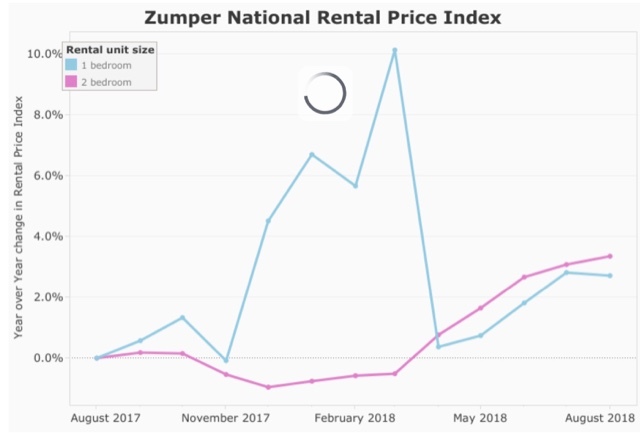 As we will see, regardless of which measure used, rent increases continue to outpace worker's wage growth, meaning the situation is getting worse. Most likely this is a result of increased unaffordability in the housing market, driving potential home buyers to become or remain renters instead. Note that HUD's measure of housing affordability also generally deteriorated in 2017, making home-buying the least affordable since 2008, although better than during the bubble years. 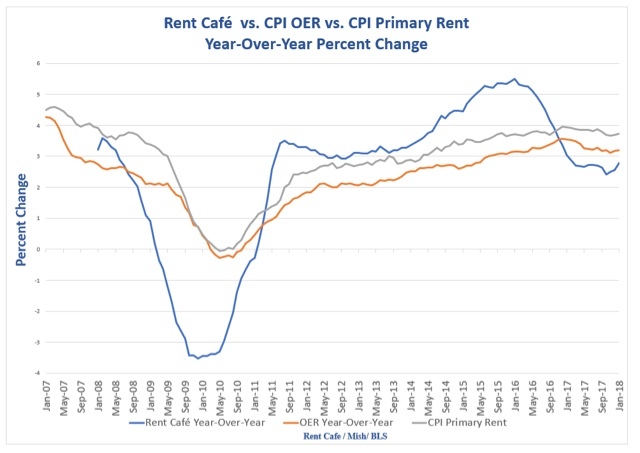 Here's the bottom line, from all 4 sources: regardless of which measure we use, rents are growing faster than nominal wages for nonmangerial workers,which have onl increased at 2.7% YoY through last month. 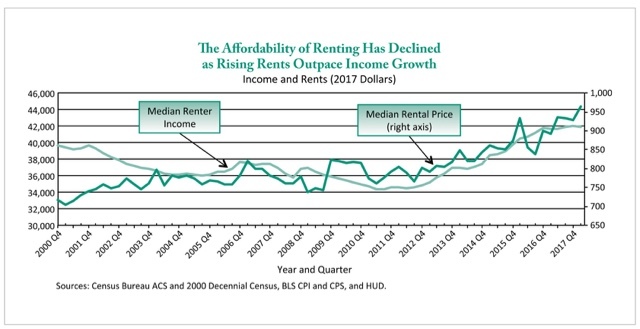 In particular, this quarter's Census report not only indicates no relief from the "rental affordability crisis," it, like all the other metrics, shows that it is becoming worse, as -- most likely -- more and more households are being shut out of the home-buying market due to 5%+ YoY increases in house prices and increased interest rates, and are forced to compete for apartments instead.